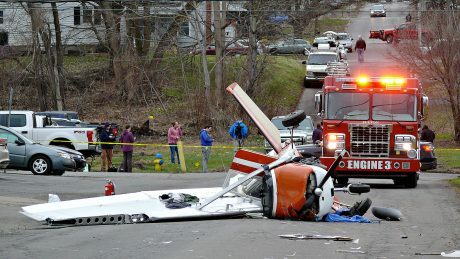 FULTON, April 11, 2019 — A small, single-engine, private plane flying south from Malone to Oswego lost engine power just miles short of the airport, attempted to glide into Fulton, grazed a utility pole with its right wing, flipped upside-down and 180 degrees around, and crashed onto a relatively quiet and wide-open section of North 4th Street in front of Stevens Auto Store this afternoon at 3:24, according to police. Pilot Michael Simpson, 50, of Chateaugay was pulled conscious from the wreck and taken by Menter Ambulance to Upstate University Hospital in Syracuse. Reached by phone Thursday evening, he said he suffered a broken wrist and shoulder. Simpson gave Green his contact information to call his wife as he was placed into the ambulance. “We know there was engine failure,” Green said. 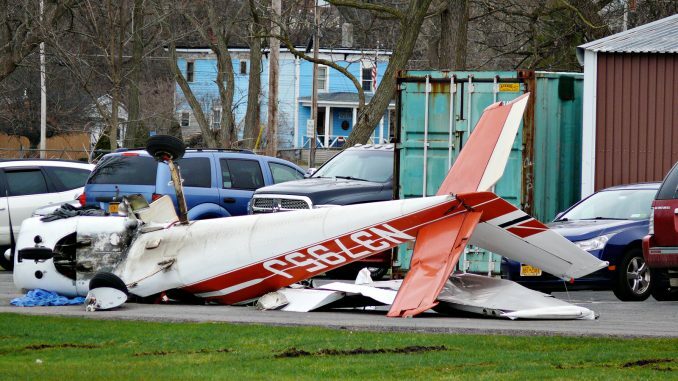 The mangled wreck of the 1966 Cessna 150G fixed-wing, single-engine plane was put onto a large flatbed truck and taken to a hangar at the Oswego County Airport where the Federal Aviation Administration (already at the crash site) will continue its investigation. $20,000. Some are listed in the high 20s.